It's very easy, but it requires a little bit of luck. So, here are the basics to this. Trust me, this isn't complicated at all. It's pretty simple. I'm just going to break down every single character that will be used in this night. Bonnie - Set him to 20. He's the easiest out of all of them, believe it or not. Just never check Pirate's Cove, and he'll never attack you. Easy as that. Mangle - Set him/her to 20 as well. Since he/she is a vent character, I'm going to explain the little strategy I made up. So the first thing you will need to do is press these keys. Remember to press all of these keys only once. (Except F. Only press F after Afton comes). 1 for turning on the Power Generator. I recommend turning it on with the hotkey instead of going to the camera and pressing it because if you go to the camera to press it, you'll have a chance of one of the phantoms to jumpscare you. Press W as well to close the vent infront of you. This will block all of the vent animatronics (like Mangle and others). Press F to close the side vent, which will block Afton, BB, and JJ. And finally, turn off the fan with space. This will use less power, but the only problem is Phantom Freddy will come faster, however it's fine since Phantom Freddy never kills you, only jumpscares you. BB - Set him to 20.You need to press F to close the side vent to block this guy, or else he'll prevent you from using your flashlight, which results in Phantom Freddy jumpscaring you. Oh, and I made a strategy for him. Once Afton has arrived and has gotten blocked (if you've done the strategy right) then press F again to open the side vent. Then, before you turn on your camera to reset the ventilation, go to the right and check the vent, then close it, and flip your camera on. This will be useful since BB and JJ can't get in while your camera isn't up, but once you flip on your camera, they'll get in. You can also use this strategy in other nights with BB or JJ in them as well. It proves to be very helpful. JJ - Set her to 20. She's about the same thing. I'll just repeat myself again if you've only started reading this, skipping the others. JJ reacts the same as BB. The only difference is she makes it so you can't close your doors. This wouldn't be a problem, but the thing is, she can also temporarily disable your side vent door, resulting in BB walking in and disabling your flashlight, which leads to a jumpscare from Phantom Freddy, and so on. Do the same strategy with her and check to the right, close the right vent door no matter if she is there or not, then flip up your camera. (Only flip up your camera if you're going to reset ventilation. There is no reason to check the vent cameras, since all of them will be getting blocked, but you can check on them if you want to see the animatronics' movement patterns). Withered Chica - Set her to 20. She works the same as Mangle, crawling in the vents. You'll want to press W at the start of the game and never press it again. It does use power, but it's still possible to make the night without running out of power if you do this right. Springtrap - Set him to 20. Same thing as Withered Chica. Press F at the start of the night, and never press it again. This may use power, but you can still make the night without running out of power if you follow the strategy correctly. Phantom Mangle - Set her to 20. She appears on your camera. If you look at her for too long on the camera, she'll appear in your office in the bottom left corner, causing an audio disturbance. This isn't that bad if you don't have the Music Man enabled, but it is annoying and distracting, so it's better off not getting it. However, if you need to reset your ventilation, press S instead of moving your mouse over the camera button, and try to click "Reset Ventilation" as fast as you can, then press S again. You have a very low chance if you do it quickly enough for Mangle to get in your office. Phantom Freddy - Set him to 20. He appears in your office, getting more visible every second. The way to make him go invisible again is to turn your flashlight on him with Z. Hold it in his direction, or else it won't have any effect. He still grows more visible while you have your camera up, so beware of that. Try to flash him the second you see a little bit of him. This will use less energy, resulting in a higher chance of survival. Phantom BB - Set him to 20. He acts the same as Phantom Mangle, except if you look at him for too long, he'll jumpscare you instead of creating an audio disturbance. Just flip your camera off and on by pressing the S key twice, or if you need to reset your ventilation, press S, then try to click the reset ventilation button as fast as you can, then press S again. You most likely won't get jumpscared. Old Man Consequences - Set him to 20. He's a little bit of a challenge. Whenever he pops up, wait for the pixelated fish to maneuver under the fishing hook, then press C. Simple as that. Thing is, if you don't, he'll disable your access to the camera, resulting in death. (I think, I've never left the ventilation off for too long). So you want to try to do it as quick as you can. Try practicing a little with only him enabled. (Be careful, DD may spawn). Ennard - Set him to 20. He's basically the same as Mangle and Withered Chica, except you can't see him on the vent camera, but it's fine. Just press W the second the game starts, and never press it again. This will block Ennard and the others, so you'll be fine. Trash and the Gang - Set them to 20. 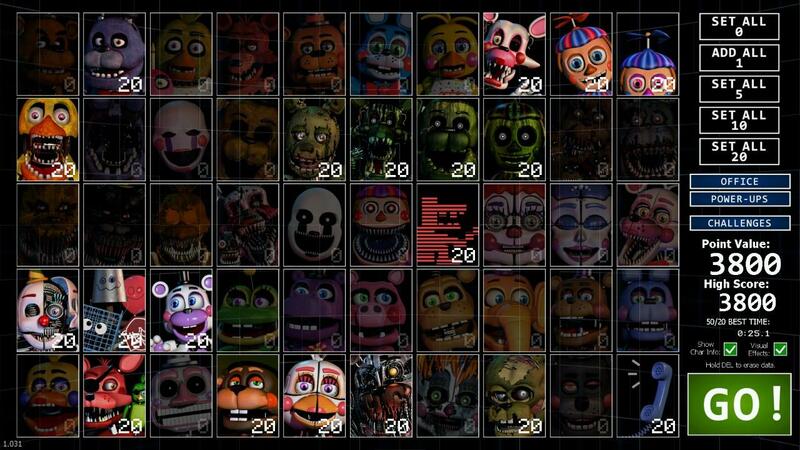 Helpy - Set him to 20. He's just a teddy bear that appears in your office. You have about 3 seconds to click on him. If you don't, he'll jump in your face covering your screen for about a second. It isn't that effective, but he makes a loud distracting airhorn noise, and also he covers your screen, making it worse. It's better to just click him before he does his little "jumpscare." Rockstar Foxy - Set him to 20. The trick with him is to never click on him. Seriously. I didn't use him to beat this, so you don't need to. But if you do, you have a very high chance of getting jumpscared, so it's better off just never clicking him. El Chip - Set it to 20. It's just an annoying advertisement that pops up along with Funtime Chica or Phone Guy. Just press enter of click the skip button to get rid of it. Fairly simple. Funtime Chica - Set her to 20. Pops infront of your screen for about a second, and causes the screen to become distorted. It can't be avoided, so sorry. You're just gonna have to try and ignore it if Old Man Consequences is on. Molten Freddy - Set him to 20. Works the same as Mangle, Ennard, and Withered Chica. Just press W at the start of the game never press it again. If you do this strategy correctly, you'll have enough power to survive the night and gain 3800 points. Afton - Set him to 20. This guy needs to be enabled for this strategy to work. You need to get lucky with him. You need to press F at the very beginning of the game, wait till he attacks, (don't open the vent while you hear his sound que. If you do, he'll kill you) and then open the vent with F. Then follow my BB and JJ strategy, and you should be good. He only attacks once per night, so you should be fine once he attacks. Phone Guy - Set him to 20. He calls you a lot, sometimes calling while El Chip's advertisement plays. You don't have to mute him, because it's kind've a hassle to do so, since his mute button is different every single time, sometimes being very close to the mask button, or being very close to the edge of the screen, making it unnoticeable. If you can't find it, then it's okay. You don't have to. You can still hear Afton's sound que, making Phone Guy very easy, but not easier than Bonnie.